When Sparky and I first arrived in Germany we had to shop for appliances as none of our US 110 volt products work here. Looking around one day down at Media Markt in Rosenheim for things like a vacuum cleaner and a toaster, Sparky stops, stares and says, “I’ve always wanted one of these.” So, I turn and look and he is rapturously looking at……an electric egg cooker. Really Dan? Really? 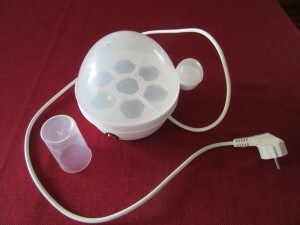 An electric egg cooker. We’ve been boiling eggs in a pan since we were kids and now you can’t live without an egg cooker? Can’t we just find a toaster and get out of here? But no…..this “I have waited my entire life for this moment” egg cooker is less than 10€ so I smile my sweet indulgent wife smile and the egg cooker that will make my man’s life complete, comes home with us. OK …When I am wrong, I am majorly wrong and I admit it. This little gadget is worth its weight in well, not gold, but maybe bronze or something. We use it constantly! 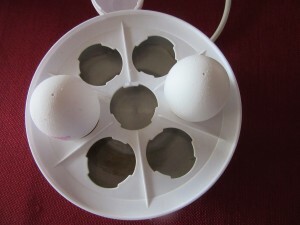 It cooks perfect soft boiled, medium boiled and hard boiled eggs without any of the guess work. 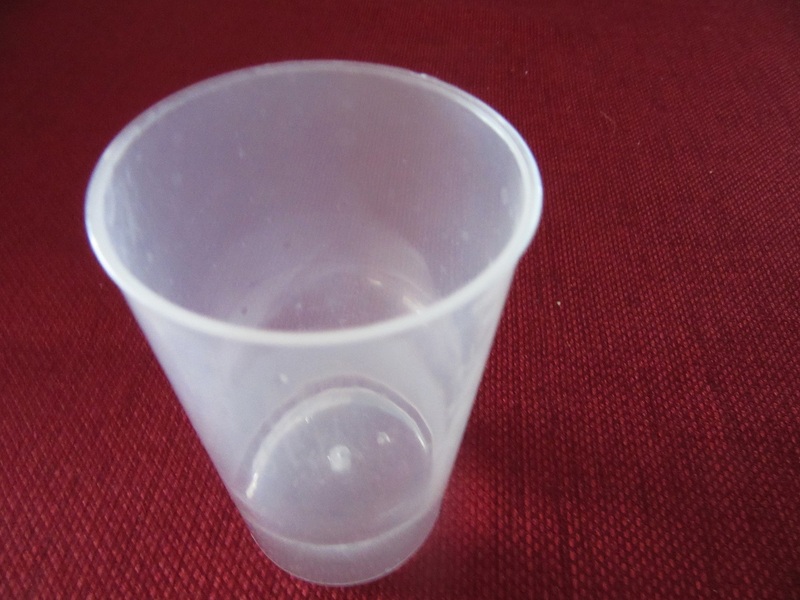 See that plastic cup with the little pointy thin on the end? It is a measuring cup and it’s labeled for the exact amount of water you need to add to the boiler for the exact number of eggs you are cooking! Fill the cup to the prescribed number for however many eggs and empty it into the cooker. Then take the pointy end of the cup and prick a hole into the fat end of the egg. Set the eggs pointy end down into the cooker, put the cover on and hit the on switch. Based on the amount of water you added the cooker knows when the water evaporates, the eggs are done. A buzzer sounds and your eggs are cooked! A couple pieces of whole grain toast and Sparky is one happy man! Yes indeed, I was wrong. And one of these cheap little gadgets will be a welcome addition to our kitchen when we return to Washington! You’re so funny. Glad Dan got what he has ” always wanted ” and it turned out to be something that you enjoy as well. Okay, I’m fascinated, and of course immediately come up with a bunch of questions. Does the “pointy thing” puncture the egg nicely, or does it ever make too big of a hole? What if you have a really large egg, will it fit into the cup deeply enough to reach the pointy thing? I’ve used needles to prick eggs to be emptied by blowing the contents out, for decorating, and it can be difficult. Does the amount of water vary for soft or hard boiled? Is there a switch for soft, medium, or hard boiled? 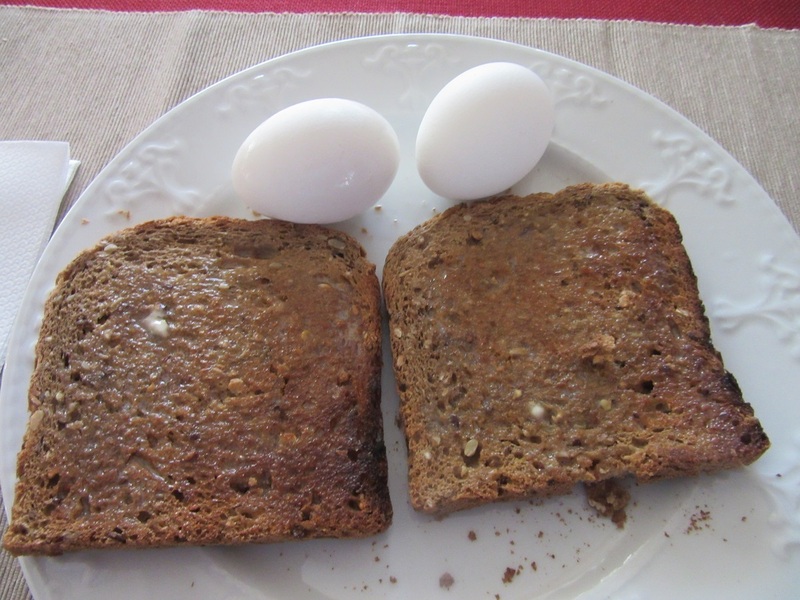 Do you have to cook different “batches” if, say, the wife prefers hard boiled, and the husband prefers soft boiled? If you’re doing a half dozen eggs of different sizes (homegrown, obviously), will they be cooked to varying soft or hardness? Also, what about hard boiling eggs for deviled eggs? No green yolk rim? Must you still ice or fast chill under cold water? 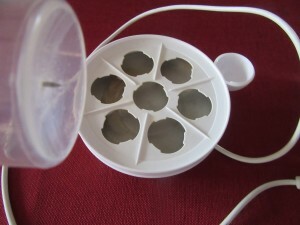 Does the steam sterilize any “debris” left on the outside of the preferably homegrown eggs, like boiling them would do? I’ll stop now, or my head may explode like an egg in a microwave! Don’t feel you need to answer all these minute details. We can have a lengthy discussion when you’re back in the States! LOL Good one, Karen! Boy, you sure made me laugh today! I have used both Medium and Large eggs with complete success. Haven’t tried Pullets or quail. I think they would fall through the opening. Ha! Yes, the pointy thing makes a nice, clean hole in the egg. I have not had any of them crack yet. But then eggs are different here. The shells are very hard. 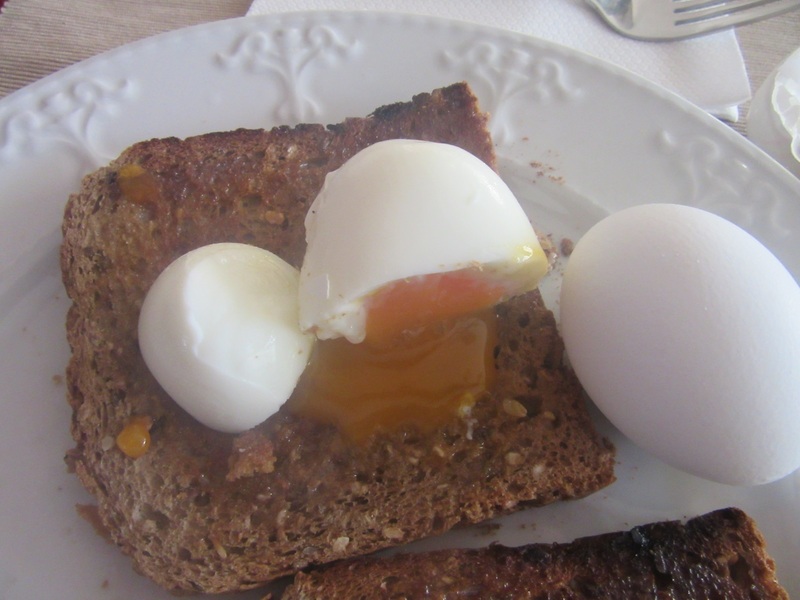 You add varying amounts of water for both the number of eggs cooked and the degree to which they are cooked. The little cup is clearly labeled. I make hard boiled eggs in the cooker all the time. They turn out perfect. No green rims. You still have to quick chill them in ice water. I assume the steam disinfects the shells as the steam is as hot as boiling water. Great post. Amazing how just shifting ad units can make such a strong impact! Hello and "WELCOME" to the Journey Girl! I'm Karen, a happy, optimistic retired RN living out my dreams with my husband Dan up here in the back of the beyond in Ferry County, Washington. High up in the mountains just 20 miles from the border with British Columbia, Canada. I enjoy writing and sharing with my friends all about our lives raising Alpacas, growing our gardens, all the gorgeous birds and wildlife that surround us. Sharing stories of our daily lives as we travel this journey through life. Cooking is my passion and I solve all the world's problem while standing at my stove and I love sharing my recipes with you. I am glad you are all here with me today and every day. Journey on!